I've been using ProGold for many years, it's the best I've found. I'm averaging over 4k year mostly commuting. This is for a road and cyclocross bikes, typically reapplying every 200 miles or so... with doing this and keeping the chain fairly clean I average around 3.5k to 4k per chain (10 and 11 speed). This is in a dusty but dry environment (Phoenix). A little goes a long way, so don't go crazy and be sure to wipe the chain down after application - good stuff. I use this lube on all my bikes, mountain and road. Have for many years. For dry dusty conditions as in Colorado I think this is the perfect lube. Provides very good lasting lubrication. I will occasionally refresh the chain between washes and find that it loosens up dirt very nicely. Appreciate the biodegradable friendliness also. For the price it's unbeatable. I pray it never goes off the market! I've been using prolink for a long time. In the past I've done a lot of ultra marathons but in recent years nothing over 125 miles. The prolink goes on easy and keeps the chain and drive train very clean. Of course I always wipe chain with a cloth before and after applying. Simply put it does not attract grime like many other lubes. I don't quite trust it for the longer rides, opting then for a wax based lube or taking the prolink with me on the ride. But again, for up to 125 miles, no problem. For the above reasons it is not the best pivot point lube but if you take good frequent care to maintain your ride and apply it often, say once every five to ten rides, it will serve you well there too. Great for the road - need something a little heavier and stickier for my mountain bike! I like how it lubricates the chain. Does not accumulate dirt. This is my preferred chain oil, do not use any other. I've been using Pro Gold for a couple years - mostly on an high-mileage all-roadgravel bike. Really like the light, dry touch of this lube. Needs regular application, but it's ideal if you do routine chain cleaning and apply fresh lube with each cleaning session. I use it in wet and dry conditions and have been getting great chain life and smooth drivetrain operation. 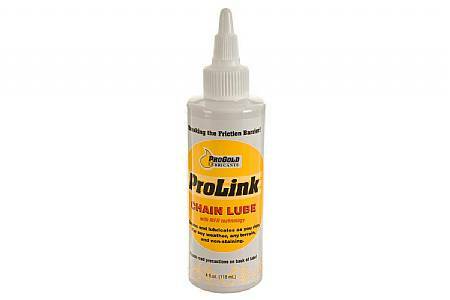 I'm new to the ProGold ProLink lube - I prefer a dry lube but was looking for something that would actually last in the dusty conditions where I liveride. ProGold is great - super light on the chain - and lasts for a couple rides - in full summer conditions on gravel roads. I'm new to ProGold lube. Previous user of finish line dry and tri-flow. ProGold is light and effective. I'm using it on a roadgravel bike in dry dusty conditions. It does not attract dirt (like tri-flow), it actually lasts for a hundred miles of riding (unlike finish line dry) and handles being hosed down after a ride without needing reapplication. It's my new favorite chain lube. Easy to apply without making a mess, thanks to the applicator top. Seems to do a decent job of chain lubing without attracting a lot of dirt. I've been able to just wipe the chain down with a rag and keep it pretty spotless. Have only been using this for road riding in dry conditions, so can't speak to how it works for dirt and muddy conditions you'd encounter on MTB or gravel riding. I have been using this product for the last 6 years on my road , mountain, and Tri bike. Never a problem with shifting or getting all gunked up. Clean and slick. Not too heavy not too light . . . just right. I may have found my go to lubricant. I was using a different high quality product prior to trying ProLink, but I think this is the stuff I will stick with. Makes the chain and cassette real black, not sure if it last as long as some of the other products I used in the past. This is good and easy to clean. Xlt chain lubricant but the cap leaks! Prolink is an xlt lubricant that also does a great job of keeping grease from building up on the chain. However, every bottle of it I have used in the past few years leaks when I apply it to a rag. Stop it from doing that! It is also a bit pricey. I've used this lube for years and it works great. I've tried multiple lubes over the years but always go back to this one. It wears well and doesn't build up or leave a mess. I ordered this to try something else. The other lubes were good - very good - but no matter how diligent I was with application, wipe down, puddle avoidance, etc, my drive train turned black after two rides. My chains lasted (DA or Ultegra only, 3500-4500 miles), but it took constant attention, cleaning, wiping, re-application, and diligence. I ordered ProGold ProLink, both Heavy Duty and Regular (HD is for my rain bike). I cleaned the drivetrain, let it dry, then applied in accordance with the directions. The next morning I rolled out for a ride (mid-winter, lots of salt, cinders, and dirt) and rode 20. The drivetrain was quiet (good) and remained silver (VERY good). I rode the next week indoors (snow, ice, wind is unfun). Still clean. I rode 30 outdoors on Saturday - still clean. This is the first lube I've used in over 30 years of road cycling that doesn't attract and hold dirt - it's amazing. It smells like kerosene (and that may be the secret) but I don't care. This stuff is GREAT, and I can highly recommend it! Just keep away from open flames while applying.